Revealing your wild side has never been easier or more swiftly done than with the help of Full Moon Bicycle® Playing Cards. A strikingly hand-illustrated beast rules the standard deck tuck box with his bulging muscles and massive strength. The reverse side depicts a stylized lunar design under which the beast emerges. Claw marks that flank the sides of the deck are indicative of the deadly caged beasts that lie within. The newly designed Full Moon backs feature the arcane magical symbol front and center as the focal point, while the dark center band breaks off the edge to allow for beautiful fan displays. Supportive scroll work gives nods to a darker gothic feel, with the smaller flanking moons on both sides mirroring the center symbol element, and adds a nice little peek-a-boo element in a fan. Inspired by the gothic design era, these pips are reminiscent of a darker time in history, where beasts and monsters were thought to have been lurking around every corner. They're stone pattern and carved accents lend themselves to a mystical rune feeling. Each court design has been hand illustrated to capture the intense details and attributes of these ferocious beasts. These creative designs display the human form, struggling to contain the beast within, as well as their fully transformed monstrous counterpart. Let yourself go, and see what beast resides in you! Ripped like no other, the ferocious werewolf that rules the ace is undoubtedly the alpha of the pack. With his unsurpassed display of strength and power, one bite from his fangs puts any foe back in place. The cunning and feral King of the clan is revealed with this playing card. With his long brown snout and pointed ears, nothing gets by this grizzly beast's heightened senses. Do not be fooled by the calm demur of the lady of the pack. Once the full moon rises, her primal side is revealed. This snarling beast knows no fear and is prepared to stalk your prey till victory. With his ravenous eyes and mangy coat, this warrior werewolf will wage battle till your hand wins victory! From their bloodthirsty eyes, menacing muscular physique, and grizzled features amid the moonlight, no details were spared when bringing these epic beasts to life. 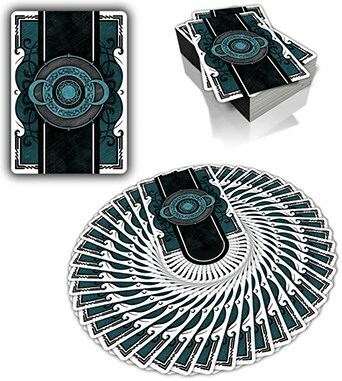 This beastly deck features custom-designed pips and pip layout. 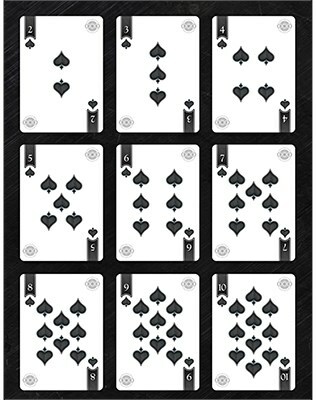 With a stark contrast, these cards are easy to read... even under the light of a full moon.